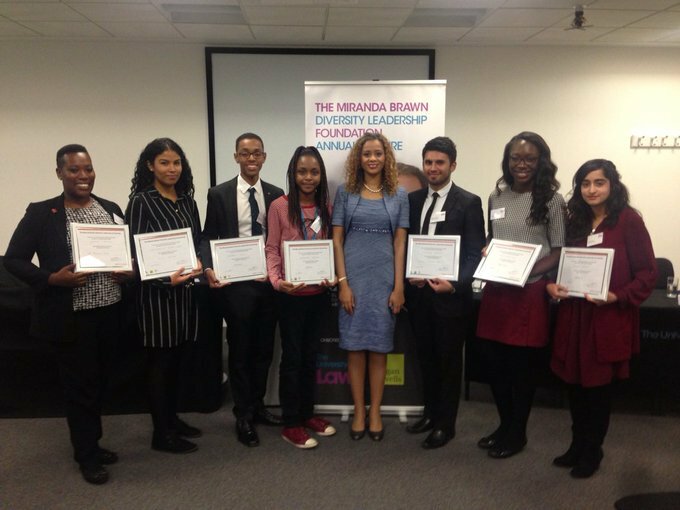 THE MIRANDA BRAWN DIVERSITY LEADERSHIP FOUNDATION IS an award winning non-profit organisation, founded by Miranda Brawn, which aims to help Black, Asian and Minority Ethnics (BAME) future leaders while increasing diversity & equality in Britain and beyond. Our work has been given an award from the UK Prime Minister and personally praised by HRH The Prince of Wales especially for making UK history by organising the UK’s first diversity lecture aimed at schoolchildren. Television Coverage for the Launch of The Miranda Brawn Diversity Leadership Foundation’s work which includes the Scholarship and Lectures. Why is The Miranda Brawn Diversity Leadership Foundation’s work important? Our workplaces are lacking in diversity with an absence of BAME, gender, age, disability, LGBT and social mobility representation which has an impact at all levels of the organisation. With a particular focus on race diversity, it is necessary to develop a pipeline of BAME talent in the 21st century. – 1 in 8 of the working population is from a BAME background. Yet only 1 in 10 are in the workplace. – Only 1 in 16 top management positions are held by an ethnic minority person. – Ethnic diversity in British boardrooms lags almost two decades behind female representation at the top level with less than 2% of British directors from a BAME background. Our Patrons have been pioneers within the diversity space for several decades. Dame Fiona Woolf DBE is a British corporate lawyer. Woolf qualified as a solicitor in 1973 and became the the first female partner at CMS Cameron McKenna in 1981. She served as the Lord Mayor of London (2013-14), acting as global ambassador for UK-based financial and business services. She is the Chancellor of the University of Law. Dame Jocelyn Barrow DBE is the Director for UK Development at Focus Consultancy Ltd. She was the first black woman to be a governor of the BBC and was founder and Deputy Chair of the Broadcasting Standards Council. Barrow was a founding member and General Secretary of Campaign Against Racial Discrimination (CARD) which is the organisation responsible for the Race Relations Act of 1968. Annual Scholarships are awarded providing funding, guidance and work experience for our next generation of young Black Asian Minority Ethnics (BAME) leaders to successfully pursue their education and careers. – An amount up to £1,000.00. – CV advice and work experience. – VIP access to “The Miranda Brawn Diversity Leadership Annual Lecture”. What is the Eligibility Criteria for The Miranda Brawn Diversity Leadership Scholarship? – Be attending school, college or university in the UK on a full-time basis. – Proven academic excellence (i.e. excellent grades). – Submit a fully completed application form and 100 words on the following theme: “What does Diversity mean to Me.” This is an opportunity to share your experience and/or ideas on diversity. Your application should be emailed to info@mirandabrawn.com. – Have an Black, Asian and Minority Ethnic (BAME) background aged between 14-21 years. – Recipients of the Scholarships will be chosen annually based on their exemplary academic performance and demonstrable interest in diversity. – The Application Form must be completed in full in order to be considered as per the instructions at the back of the form. – Applications are submitted via email to info@mirandabrawn.com. – The Judging Panel selects the winners of the scholarships. – Successful applications will be informed on the day of the lecture. Application Form: There are new application forms to allow for more information and to cater for the different scholarships on offer which can be located via Scholarship Application Form, for the Mosaic LGBT Scholarship via MBDL Scholarship Application Form – Mosaic LGBT Youth Centre (1) and for The Prince’s Trust via PTX.MBDL Scholarship Application Form – Prince%27s Trust. 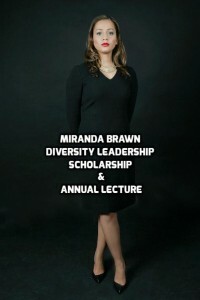 The Miranda Brawn Diversity Leadership Annual Lecture is held during the month of October. The aims are to raise the awareness of diversity and equality with the next generation of future leaders followed by The Miranda Brawn Diversity Leadership Scholarship award ceremony. The Sponsor and Host for the 2016 and 2017 Lectures is The University of Law. The lecture celebrates some of the excellent and inspiring achievements of our next generation of BAME leaders from across the UK. Britain’s best BAME future talent will come together for an inspiring event while learning more about the creation of a more diverse and inclusive workplace to enable future success. This is a service where resources, experiences and advice are shared to speed up the success process for the next generation. All fees for this service are donated to the Foundation to help increase race diversity in the workplace. Emailinfo@mirandabrawn.comfor further information and to book your one-to-one mentoring session with Miranda. We have access to a wide network of diverse talent especially from a BAME background which can assist organisations and individuals seeking to adopt competitive recruitment strategies. Email info@mirandabrawn.com for further information and introductions to top BAME talent. “The Miranda Brawn Diversity Leadership Foundation has been a blessing. As a scholar, I’ve been able to attend the inaugural Diversity Leadership lecture, to buy books for my degree and, above all, I’ve benefitted from the wonderful mentoring of Miranda Brawn. “It has been an absolute honour and blessing to be part of the Miranda Brawn Diversity Leadership Scholarship’s inaugural cohort, and I am grateful to Miranda and her team for their work. The Foundation, the scholarship programme, the annual Diversity Leadership lecture and what they each stand for are wonderful and resonate with me given my heart for increased diversity and representation in academic and professional environments. However, by far the best part for me in the whole process has been the wonderful counselling and mentorship provided by Miranda herself. To have such direct, one-to-one access to someone with such incredible expertise, a stunning repertoire and a stellar track record for success is an honour and a privilege for which I will ever be grateful. But more than that, Miranda has become a friend, and that, for me, is priceless. Miranda has the incredible capacity to see where you are now, in terms of your personal and professional development, and encourage you there, and simultaneously see your potential and where you could and can be given the right investment and strategies, and to nurture you to that point. To anyone thinking of applying, this is a priceless opportunity.” – Imani Jeffers, University of Cambridge, and The Miranda Brawn Diversity Leadership Scholarship 2016 Winner. “I was honoured and appreciative to learn that I was selected as one of the first recipients of The Miranda Brawn Diversity Leadership Scholarship with the Prince’s Trust. As a Social Entrepreneur, campaigning to provide more opportunities for young adults from LGBT and BAME backgrounds, I knew working with Miranda Brawn would be the perfect fit. Miranda’s altruism speaks volumes to me. Her focused and personal approach to mentoring instantly put me at ease and I am in awe of her unyielding dedication to the next generation of Diversity Leaders. “Miranda’s mentoring programme helped me get a job offer within 3 weeks after several months of rejection. Miranda’s mentoring is a must for anyone who needs help with their career goals.” – Ahmed, trainee accountant, Bradford. – 29th March: Applications open. – 29th June: Applications close at midnight. – 21st September: Confirmed attendees for Annual Lecture. – 21st October: Winners announced at The Miranda Brawn Diversity Leadership Annual Lecture. We have several sponsorship opportunities where organisations and individuals can help the work of the Foundation. Some of the media links highlighting the work of the Foundation.